Bottom Round Roast (Outside Round), Oven And Pot Roast Instructions. 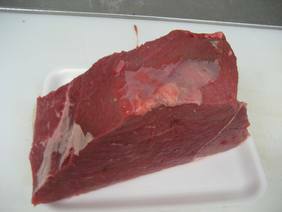 The bottom round or in Canada called the outside round roast, is the outer part of the round where muscles are well exercised, so it contains tough muscles and some connective tissue. This cut may have the least flavor of all the beef cuts, to avoid a rubbery, chewy texture it must be sliced thin and not overcooked if dry roasted, so therefore we prefer to cook the bottom round using the oven pot roast method. 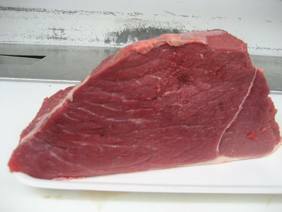 If you prefer the dry roasted method click here and follow the cooking instructions for top round roast. Adding seasoning and herbs will help to enhance the flavor, bottom round is an affordable roast and most people when they think of pot roast recipes they don't consider bottom round but it does make a decent pot roast. Season with salt, pepper or ¼ cup of dry red wine if desired and boil for 5 minutes. Use a slotted spoon to remove vegetables and pour sauce over the meat.